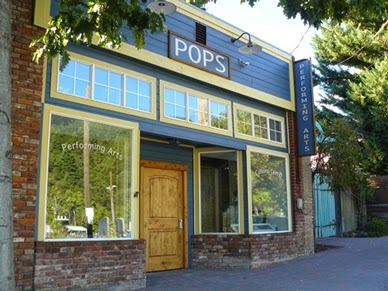 Graces The POPS in Dunsmuir! 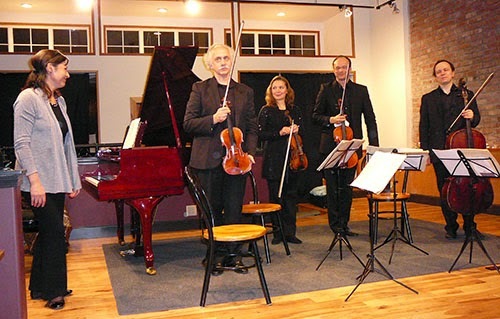 Svitlana Smaga, (L.) joined the Rimsky Korsakov String Quartet for a piano quintet by Russian composer Nikolas Medtner. The quartet played an encore composed by local musician, Marge Wheeler. "Nothing less than a stellar balance of dynamics, technique and passion forced the crowd to it's feet, not once but three times, on Tuesday evening (March 10, 2015) at the POPS Performing arts and Cultural Center in Dunsmuir. The Rimsky Korsakov String Quartet eloquently delivered a classical concert that included the works of Tchaikovsky, Medtner and Shasta local composer, Marge Wheeler." "The POPS Performing Arts and Cultural Center offered a sensual balance of intimate surroundings and aural acoustics with its 'open air gallery' decor and the antiquity of its brick walls embracing the rich, full and passionate sounds of 2 violins, a viola and a cello known as The Rimsky Korsakov String Quartet. The Quartet, based in Saint Petersburg, Russia, was formed in 1939 and is one of the most prominent Russian chamber music groups in the world." Music by the Mountain wishes to thank everyone who played a part in making this such a successful concert. "Sally ... I got to peek through the front curtain to see the backs of the performers and row after row of rapt listeners. I was quite contented to wait for another classical performance at Pop's. It looked like a event anyone would want to attend. Sold Out!!! Music by the Mountain has developed a list of individuals in Siskiyou County who provide vocal and instrumental music lessons. We hope it helps you connect with the right teacher.